Allen College has agreements with education institutions to facilitate the seamless transfer of qualified college students to Allen College to earn the Bachelor of Science in Nursing (BSN) degree. Click here to view the transfer equivalency guides for collaborative institutions. An affiliation agreement between Aultman College and Allen College facilitates the seamless transfer of qualified Aultman students to Allen College to earn the Bachelor of Health Sciences (BHS) degree with a major in Diagnostic Medical Sonography (DMS), Nuclear Medicine Technology (NMT) and Public Health (PH). Through the agreement, Aultman College students may take all general education requirements at Aultman College. Students seeking admission to other Allen College programs may also complete some or all of the general education coursework at Aultman College. Communication with admissions, administration, faculty and staff from each college is ongoing to better serve students. Allen College also provides education for the faculty of Aultman College in the EdD program. An affiliation agreement between Central College and Allen College facilitates the seamless transfer of qualified Central College students to Allen College to earn the Bachelor of Science in Nursing (BSN) degree. Through the program, students complete general education requirements at Central College and also have the opportunity to earn a bachelors degree at Central College. The program assures qualified Central College students of admission to the 15-month option in Allen College's BSN degree program. Information about the program is available from admissions offices at both colleges. 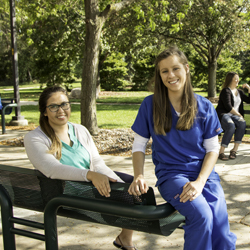 An affiliation agreement between Drake University and Allen College facilitates the seamless transfer of qualified Drake University students to Allen College to earn the Bachelor of Science in Nursing (BSN) degree. Through the program, students complete general education requirements at Drake University and also have the opportunity to earn a bachelor's degree at Drake University. The program assures qualified Drake University students of admission to the four semester accelerated option. Information about the program is available from admissions offices at both colleges. The affiliation agreement between Hawkeye Community College and Allen College facilitates seamless transfer of students to Allen College. Students successfully completing the associate degree in nursing can seamlessly begin the RN-BSN completion programs. In addition, students in the Dental Hygiene program can seamlessly begin the Bachelor of Health Sciences (BHS) degree with a major in Public Health. Students seeking admission to other Allen College programs may also complete some or all of the general education coursework at HCC. Communication with admissions, administration, faculty and staff from each college is ongoing to better serve students. Many student services can prove to be mutually beneficial. The affiliation agreement between Indian Hills Community College and Allen College facilitates seamless transfer of students to Allen College. Students successfully completing the medical lab technician program can seamlessly begin the Bachelor of Health Sciences (BHS) degree with a major in Medical Lab Science. Students seeking admission to other Allen College programs may also complete some or all of the general education coursework at Indian Hills Community College. Communication with admissions, administration, faculty and staff from each college is ongoing to better serve students. Many student services can prove to be mutually beneficial. An affiliation agreement between Iowa Lakes Community College and Allen College facilitates seamless transfer of students to Allen College. Students successfully completing the associate degree in nursing can seamlessly begin the RN-BSN completion program. Students seeking admission to other Allen College programs may also complete some or all of the general education coursework at ILCC. Communication with admissions, administration, faculty and staff from each college is ongoing to better serve students. An affiliation agreement between Loras College and Allen College facilitates the seamless transfer of qualified Loras College students to Allen College to earn the Bachelor of Science in Nursing (BSN) degree. Through the program, students complete general education requirements at Loras College and also have the opportunity to earn a Bachelor of Science degree in biology at Loras College The program assures qualified Loras College students of admission to either the 15-month option or the 5-semester traditional option of Allen College's BSN degree program. Information about the program is available from admissions offices at both colleges. An affiliation agreement between Northeast Iowa Community College and Allen College facilitates the seamless transfer of students to Allen College. Students successfully completing the associate degree in nursing can seamlessly begin the RN-BSN completing program. Students seeking admission to other Allen College programs may also complete some or all of the general education coursework at NICC. Communication with admissions, administration, faculty and staff from each college is ongoing to better serve students. An affiliation agreement between Northwest Iowa Community College and Allen College facilitates seamless transfer of students to Allen College. Students successfully completing the associate degree in nursing can seamlessly begin the RN-BSN completion program. Students seeking admission to other Allen College programs may also complete some or all of the general education coursework at NWICC. Communication with admissions, administration, faculty and staff from each college is ongoing to better serve students. An affiliation agreement between Simpson College and Allen College facilitates the seamless transfer of qualified Simpson College students to Allen College to earn the Bachelor of Science in Nursing (BSN) degree. Through the program, students complete general education requirements at Simpson College and also have the opportunity to earn a Bachelor of Arts degree at Simpson College. The program assures qualified Simpson College students of admission to either the 15-month option or the 5-semester traditional option of Allen College's BSN degree program. Information about the program is available from admissions offices at both colleges. An affiliation agreement between Southeastern Community College and Allen College facilitates seamless transfer of students to Allen College. Students successfully completing the associate degree in nursing can seamlessly begin the RN-BSN completion program. Students seeking admission to other Allen College programs may also complete some or all of the general education coursework at Southeastern Community College. Communication with admissions, administration, faculty and staff from each college is ongoing to better serve students. An affiliation agreement between Southwestern Community College and Allen College facilitates seamless transfer of students to Allen College. Students successfully completing the associate degree in nursing can seamlessly begin the RN-BSN completion program. Students seeking admission to other Allen College programs may also complete some or all of the general education coursework at Southeastern Community College. Communication with admissions, administration, faculty and staff from each college is ongoing to better serve students. An affiliation agreement between The University of Iowa and Allen College facilitates the seamless transfer of qualified University of Iowa students to Allen College to earn the Bachelor of Health Sciences (BHS) degree with a major in Medical Laboratory Science (MLS). Through the agreement, The University of Iowa students may take all general education requirements at The University of Iowa. This program guarantees up to ten students from The University of Iowa admission to the BHS-MLS program, provided the student meets all stipulated admission and progression requirements and provided The University of Iowa has clinical space for the students. Information about the program is available from admissions offices at both colleges. An agreement of cooperation between Allen College and the University of Northern Iowa (UNI) facilitates the education of Allen College students. Students enrolled in degree programs at AC may take courses at UNI to fulfill some or all of Allen College 's general education requirements. Courses taken at and offered by UNI are accepted for transfer credit by Allen College. Allen-UNI affiliated students (defined as AC students who have been enrolled at UNI) have access to student services, international student services and activities, library, health and wellness services, housing and academic advising and other appropriate services provided by both AC and UNI following the transfer. An affiliation agreement between Wartburg College and Allen College facilitates the seamless transfer of qualified Wartburg College students to Allen College to earn the Bachelor of Science in Nursing (BSN) degree. Through the program, students complete general education requirements at Wartburg College and also have the opportunity to earn a Bachelor of Arts degree in biology at Wartburg College. The program assures qualified Wartburg College students of admission to either the 15-month option or the 5-semester traditional option of Allen College's BSN degree program. Information about the program is available from admissions offices at both colleges. An affiliation agreement between Winona State University and Allen College facilitates the seamless transfer of qualified Winona State University students to Allen College to earn the Bachelor of Health Sciences (BHS) degree with a major in Medical Laboratory Science. Through the program, students complete general education requirements at Winona State University and also have the opportunity to earn a bachelor's degree at Winona State University. The program assures qualified Winona State University students of admission to the Medical Laboratory Science program. Information about the program is available from admissions offices at both colleges.